Iceberg kicked off London Fashion Week Men's on Friday evening with a colourful sportswear-inspired runway show. It was a first incursion into the British capital for the historic, Gilmar group-owned Italian brand, which usually presents its collections in Milan, and the label chose to stage a joyful show, orchestrated by Creative Director James Long, with models heading out for a stroll around town after the final bow, walking out among the public as far as Trafalgar Square. "For me, it's a return to the brand. I feel at home here. For this collection for next summer, I mixed the house's pop codes with a more British spirit," said the designer. And indeed, with their banded tracksuits paired with jackets or large sweaters, the models did have something of a "bad boy" feel. 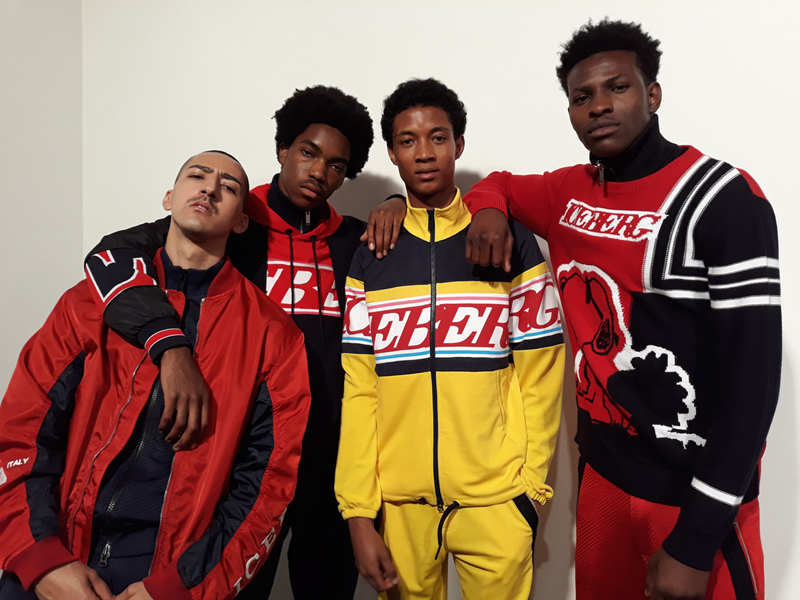 T-shirts and jumpers, where Iceberg's name stood out in capital letters, were worn over zipped-up jogging jackets and coupled with nylon or jersey pants, or drawstring bermuda shorts. This "sporty cool" look, which has been popular on the catwalk for the last few seasons, was interpreted here through a wide range of pieces, from football shirts to hooded sweatshirts. The designer was particularly inspired by the world of motocross and Formula 1, referencing the the period when the brand, an expert in mesh, sponsored the auto Grands Prix. Checkerboard motifs therefore appeared here and there, on the shoulders of a pullover with wide stripes, for example. Elsewhere, thick fluorescent yellow bands featuring the brand's logo were incorporated into the sleeves of a black sweater, playing the role of security armbands. The show's pop vein could be seen in the Snoopies and Charlie Browns printed on a number of pieces, as well as in its energetic palette, which combined reds, turquoises, yellows and fluorescent orange – not to mention the pink outfits. Sneaker laces were all brightly coloured, as were the vinyl shoulder-strap bags that the models carried on their backs. A handful of looks from the womenswear pre-collection were also unveiled, with models perched on transparent high-heeled ankle boots, poured into micro-dresses or flaunting mini-skirts and crop tops.